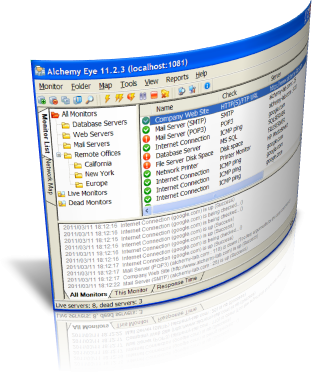 Alchemy Eye continuously monitor network server availability and performance. It supports over 50 monitoring types, including, but not limited to: ICMP ping, NT Event Log monitoring, HTTPS/FTP URL checking, free disk space monitoring, etc. Alchemy Eye automatically notifies the Network Administrator about server malfunction events. In the case of a network failure this network monitor can execute actions of more than 18 different types, including, but not limited to: sending email alerts, restarting computers or services, execution of SQL sripts, etc. Alchemy Eye can log application events to a log file. Different log file detail levels (none/normal/full) and log file formats (text, HTML, CSV, SQL database) can be configured to suit your needs.